Sean Burke went through the pressure-cooker existence that is being a Canadian goaltender at the Olympics. Three decades later, Burke is in the hot seat once again. Thirty years ago, when Sean Burke was 21, some in the hockey world wanted to card him to make sure he wasn't a whole lot older. He arrived on the NHL scene with the New Jersey Devils, a few days removed from his pressure-cooker existence as the Canadian goaltender at the Calgary Olympics, mature beyond his years. His first NHL game could have gone better. He relieved Alain Chevrier after two periods and surrendered two goals on six shots. But then Burke reeled off 10 victories in 11 games to push the franchise Wayne Gretzky called "Mickey Mouse" four years earlier into the playoffs for the first time. Burke's season was far from over. He continued to exhibit his maturity and handled the playoff pressure with the presence of a veteran. The Devils upset the New York Islanders in the first round, then took care of the Washington Capitals. In the East final – yes, the conference final that New Jersey coach Jim Schoenfeld told referee Don Koharski to "have another donut" – Burke and the Devils stretched the Bruins all the way to a seventh and deciding game. But Boston managed to stop the Devils' Cinderella run. Three decades later, Burke is in the hot seat once again. He's the general manager of the Canadian men's Olympic hockey team. There are no NHLers this time around and Burke's task was to scour Russia, Sweden, Germany, Switzerland, the American Hockey League, U.S. college and junior ranks to put together the best collection of Canadian players not in the NHL. "The most enjoyable thing for me has been to be able to put myself in their shoes," Burke said. "This was a negative in many ways. The first stories were about this is not the NHL, this is not a best-on-best tournament. "But this was a positive for these guys from Day 1. I had two chances to play in the Olympics for Canada and loved every minute of it. These guys are looking at it that they earned their way onto the team because they came in from Day 1 and they knew how great an opportunity it was and they seized it. Now it's up to them to make their mark." Burke left his mark as an Olympian. The Canadians finished fourth in 1988, peaking too early when they shocked the hockey world and upset the Big Red Machine of the Soviet Union right in Moscow to win the prestigious Izvestia tournament several weeks before the Olympics began. When Burke returned four years later, Canada advanced to the gold-medal final and lost to Russia 3-1. It was a better result, but still a bitter loss. Burke finished a 324-win, 19-year NHL career. In between, he won two world championships in 1997 and 2003. But after he made 35 saves for the Los Angeles Kings in a 3-2 loss to one of his old teams, the Phoenix Coyotes on Apr. 5, 2007, Burke knew he wanted to stay in the game. He was open to any position. So he went in to see one of his old bosses, Coyotes general manager Don Maloney. Burke's first job was as the Phoenix's director of player development. Then he was a goalie coach and assistant general manager. "As you get toward the end of your career, you realize that you don't know everything you thought you did," said Burke, now a pro scout with the Montreal Canadiens. "You also wonder how you are going to replace the excitement and the overall enjoyment you get out of playing. There are very few things that allow you to do that. So you start to wonder if staying in the game, either coaching or management, is what you should do. "For me, this was a way to continue to try and win a Stanley Cup." As the Canadian Olympic GM, it's a way for Burke to continue to pursue an Olympic gold medal that he came so close to winning as a player and also gain experience as a GM. Even though Burke was officially sworn in as the Canadian Olympic GM last summer, his work began helping Hockey Canada put together a roster for the Deutschland Cup in the fall of 2016. Since then he has sought advice from Wayne Gretzky, St. Louis Blues GM Doug Armstrong, Maloney, Calgary Flames GM Brad Treliving as well as Toronto Maple Leafs GM Lou Lamoriello, who selected Burke 24th overall for the Devils at the 1985 NHL draft. 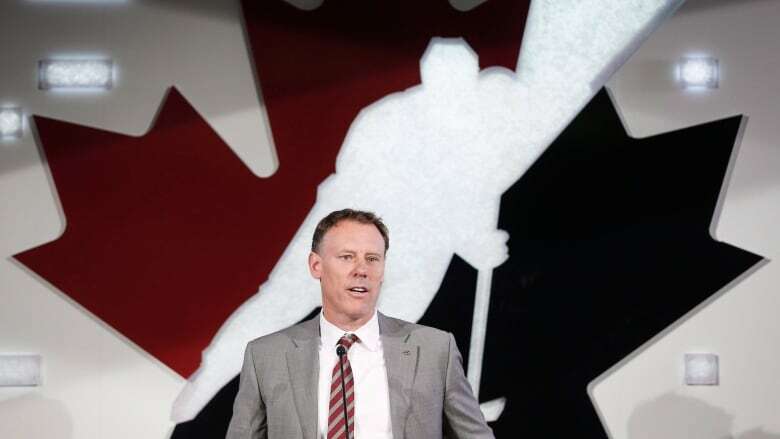 "Even though he's an American I made sure I could steal as much as I could from him," said Burke, who also credits Hockey Canada executives Tom Renney and Scott Salmond for their counsel throughout this journey. "This experience over the last year-and-a-half, I thought I was ready to be a general manager, but I wasn't. I'm lucky to have this experience." When you chat with the calm and cool Burke, you'll often hear him utter the words lucky or fortunate. But nothing has ever been given to him. He's had to work hard to scratch out his spot in the hockey world. Growing up in downtown Toronto, he lived with his dad Ron, a true character who fortified his income with his knowledge of the horse-racing game. Ron scraped by, too. But his son wouldn't trade anything for his life as a kid. In some ways, Burke's 51 years of perseverance and patience mirrors the 25 players he selected for this team. Nothing has come easy for this group, but they have found ways to continue to pursue their life in hockey. We'll see over the next two weeks what kind of ending is in store for Burke and his players.